Wednesday March 16th 1892 We finished the ironing this morning and done a little more work in the pantry. Will helped me put down the new rag carpet before noon. In the afternoon Sadie and I washed a carpet and I did a little baking. Hatt & Fanny were over. I read in the eve. Thursday March 17th 1892 We done another big washing this morning. Mother went to town for the day. I did some baking before noon. After dinner I let Sadie go. I did some ironing, cleaned the hall, and put in a quilt in the clean room up stairs. Just at supper time we had a great time with Winnie that used to work here and her Mother. I read in the evening. Friday March 18th 1892 I was busy about the work all forenoon as I got up the dinner while Mother helped Mary Woolf, Hattie & Fanny with the quilting in the forenoon. After dinner I went up and Marys girls came over so we got a lot done and had a nice visit besides. The weather had been freezing cold all week. [the following text is written vertically in the right margin of the above entry] The men went to the timber for the day. 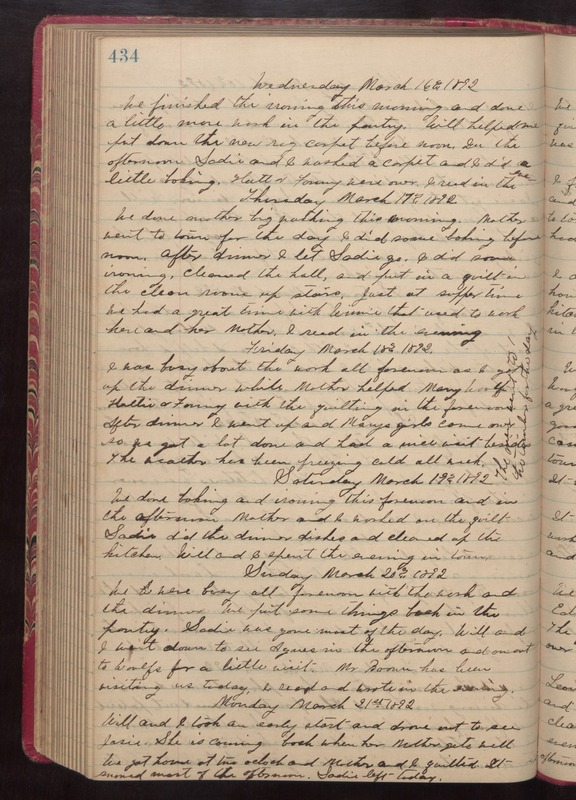 Saturday March 19th 1892 We done baking and ironing the forenoon and in the afternoon Mother and I worked on the quilt Sadie did the dinner dishes and cleaned up the kitchen. Will and I spent the evening in town. Sunday March 20th 1892 We were busy all forenoon with the work and the dinner. We put some things back in the pantry. Sadie was gone most of the day. Will and I went down to see Agnes in the afternoon and on out to Woolfs for a little visit. Mr Brown has been visiting us today. I read and wrote in the evening. Monday March 21st 1892 Will and I took an early start and drove out to see Josie. She is coming back when her Mother gets well. We got home at two oclock and Mother and I quilted. It snowed most of the afternoon. Sadie left today.